Visual Traders who need visual clues on their chart to determine when to enter and exit. Kinesthetic Traders who just "feel" the market. I am a visual trader. And as a visual trader, I need trading indicators to trade the markets. I use the MACD trading indicator to identify bullish and bearish market conditions. Green Bars mean bullish market conditions, Red Bars mean bearish market conditions and Black Bars mean neutral market conditions. The color of the bar is NOT an entry signal in itself. It's just an "early warning signal". When I see green bars, I look for LONG trades and when I see red bars, I look for SHORT trades. I use the the RSI trading indicator to determine the strength of a trend. In a strong uptrend, I plot Green Triangles underneath the green bars. And in a strong downtrend, I plot Red Triangles above the red bars. This way I can easily determine when a strong trend starts and when it loses its momentum. There are five (5) important support and resistance levels on my chart. These horizontal lines are automatically plotted on my chart at the beginning of the day. And as you can see in the example above, often these levels hold as support or resistance. I need to know these levels so that I don't trade right into support or resistance. On top of the screen you'll see "SS Target" written in green, and "SS Stop" written in red. These are my exit points for the market I'm watching. The stop loss and profit target are dynamically calculated based on the Average Daily Range. I like to take as much guesswork out of trading as I can. Therefore I use these values as so-called "bracket orders" on my trading platform and put my trades on autopilot, so that I don't over-manage my trades. I like to know when to exit a trade before I enter it. This way it's easy for me to determine my position size and take emotions out of my trading. I personally like to trade the first two hours after the US stock markets open, i.e. from 9:30 - 11:30am Eastern Time (New Tork Time). The yellow highlighted zone shows the bars that are within my preferred trading time, so that I don't miss any trades. The setup above helps me to make quick trading decisions. My charts are clearly telling me when to enter and exit a trade. If you are interested in this chart setup and think it might help you in your trading, just fill click on ADD TO CART below and I'll send you the trading indicators and videos on how to install them. 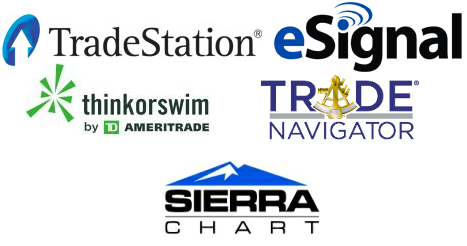 In short: These trading indicators are available for the most popular charting software packages in the market. When you purchase these indicators, you get Unlimited Lifetime Use and Lifetime Updates Included. Just click ADD TO CART and fill our the form on the next page.